Participating in a challenge is a good way to get your creative juices flowing. This sketch by Narelle Farrugia at Freshly Made Sketches is so clean and simple. I struggle with simple cards because I love embellishments. Love You Still has some lovely images and the sentiments are spot on for a wedding or anniversary card. I can even see these sentiments working well for a baby card. So sweet! 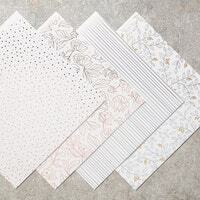 The Spring Foil Designer Series Paper is one of the new offerings during Sale-a-bration. This paper can be yours for free with a $50.00 purchase. It gave me the perfect inspiration for this card. Mixing gold, silver and copper is very trendy. You can mix and match the papers and ribbons for a special on-trend card. Start with a Smoky Slate card base. Heat emboss the sentiment using Gold Embossing Powder on Very Vanilla cardstock. The flourishes are die cut using the Flourish Thinlits. Use wax paper when cutting detailed elements. The wax paper helps the cardstock pop right out of the thinlit. One quick swipe with the Big Shot Die Brush will get all the tiny chads out of the thinlit. Layer the Gold Foil, DSP, ribbon and focal elements to add dimension and texture. Your beautiful card is complete. It is so good to be back creating and stamping! I sure did miss my crafty time. Holidays are always fun, but coming home is special also. Now, if the laundry fairy would visit it would be even better! Gorgeous card! The foil adds such an elegant look! Thanks so much for joining us at Freshly Made Sketches.